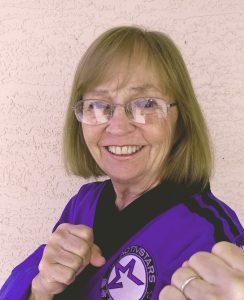 Sifu Sue Riese, a Black Belt in Chinese Kenpo Karate, has studied martial arts for 20 years with Sifu Mark Steuver. Sifu Riese has taught Chinese Kenpo to individual students and groups for the past 15 years. She currently assists at classes, tournaments, testing, and special events such as Masters’ Camps and summer camp. In addition to her continued studies in Chinese Kenpo, Sifu Riese is currently studying kungfu with Sifu Steuver. Sifu Riese’s background includes extensive work with both children and adults. She has taught elementary school and was a director of childcare programs. While living in Germany she earned a degree in counseling and counseled soldiers with substance abuse difficulties. During her professional career as a counselor and school psychologist, Dr. Sue Riese trained hundreds of adults in nonviolent crisis intervention. Through her company, Learning Adventures, Dr.Riese and her husband Leigh conducted Women’s Self Defense workshops, and took small groups on camping trips that combined karate training with beginning sailing instruction. In addition, Dr. Riese taught meditation and wellness classes. Dr. Riese believes in mind, body and spirit working together for wellness.